If you are looking for a high-speed shaver that trims your hair perfectly and helps you in maintaining your facial contours just the way you want, the Braun Series 3 3000 Men’s Electric Foil Shaver is the right option for you. It is a rechargeable and cordless model, which helps you to get the perfect shave while you are on the go. Just like all other Braun series models, this shaver is also packed with powerful technology and is designed in such a way to provide you with a comforting, quick and smooth shave, without causing any damage to your skin. Look through our electric shaver review for the features, pros and cons of this shaver so it becomes easier for you to make the call if it is worth your money or not. Packed with Micro Comb Technology which captures more hair per stroke, and it is very effective on 3-day beards. It has 2 rows of fine, even spaced grooves which help to move the hairs to the trimmer in middle to be cut. This helps you to be able to shave much faster. Triple Action cutting system with the twin foils and middle trimmer all working to cut both long and short hairs on each pass. Each of the cutting elements move independently. Waterproof, so washing and cleaning become an easy process, and can be submerged in water 5 meters deep. Can be used both corded and cordlessly to shave ensuring you never run out of power. Some users feel it left their face feeling dry after use, but very few complaints about skin being irritated. 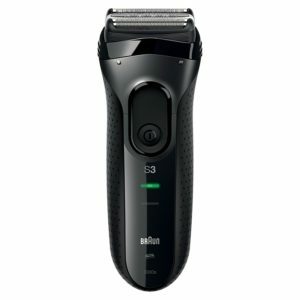 At just about £40, one should not expect too much from the Braun Series 3 3000 Men’s Electric Shaver. If you are looking for a decent, base line model and comfortable shaver (wet and dry) for everyday use, you will get a decent shave. Also, like all other Braun shavers, this model also is very gentle on your skin. So, you don’t have to worry about skin irritation and rashes. The reviews on the electric shaver are 3.7 out of 5 stars with just over 50% being 4 star or more. The Braun 3 3000 Men’s Electric razor is rated with many 3 star reviews also, and as a base model this is what you would expect. Should you shave your beard off every so often? Copyright © 2019 Beard Trimmer Reviews.